Tired of Bangkok and wanting some sea and sand, we booked a ticket for the second class sleeper train to Chumphon and a catamaran to Koh Tao. The train was scheduled to leave at 9pm and arrive in Chumphon at 5 am! 9pm came and went and the train was still on the platform – we soon learned that nothing in Thailand runs on time. An hour or so later, the train left the station and we prepared for the long night ahead of us. 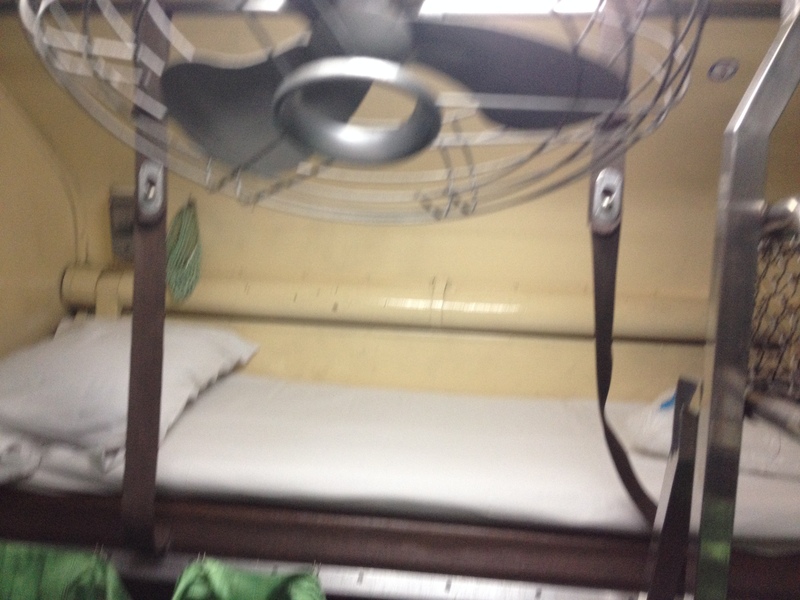 An hour into the journey, one of the train attendants came round to set up the beds with fresh linen, pillows, blankets and a curtain. The two bottom seats joined together to make a bunk. Whether you had the top or bottom bunk would depend on your seat number. As soon as they set up the beds, I got into my bunk as the lady below me wanted to go to sleep. The carriage was freezing (A/C) and they didn’t turn the main light off! However I’d come prepared with long trousers, a fleece and an extra blanket so I was fine, but Marc and Kyle didn’t sleep a wink. I fell asleep and woke at 5am when the train attendant told me it was 10 minutes to Chumphon, which I thought was pretty efficient! 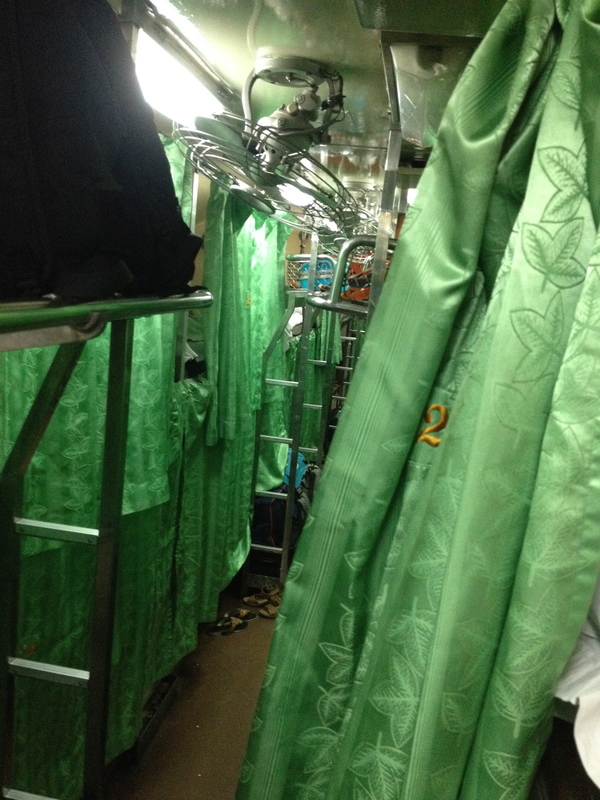 I actually really enjoyed the sleeper train experience – I’d do it again! Tired of temples and tuk tuks, we decided to spend our last day in Bangkok walking around an area called Siam Square. After spending the morning at Jim Thompson’s House (home of the American that apparently saved the Thai silk industry in the 50s and 60s), we happened to stumble on Bangkok’s Art and Culture Centre which was holding a Hair Tattoo Show. We didn’t quite realise what was going on at first as we just saw a huge crowd of people with crazy hairdos and designs! 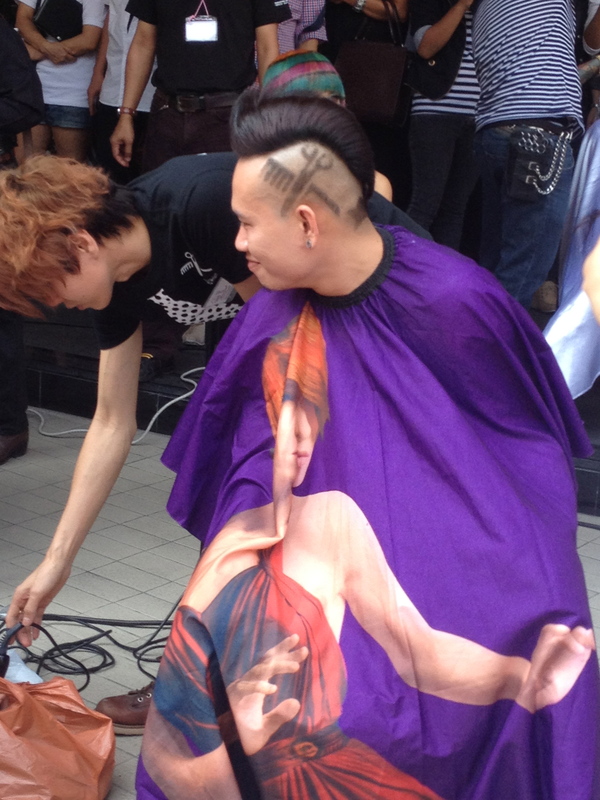 We then realised people were sitting in chairs and having their hair shaved into detailed and colourful designs. We were just standing in the crowd taking in what was going on when this very camp Thai guy spotted us and motioned us to be in their pictures. 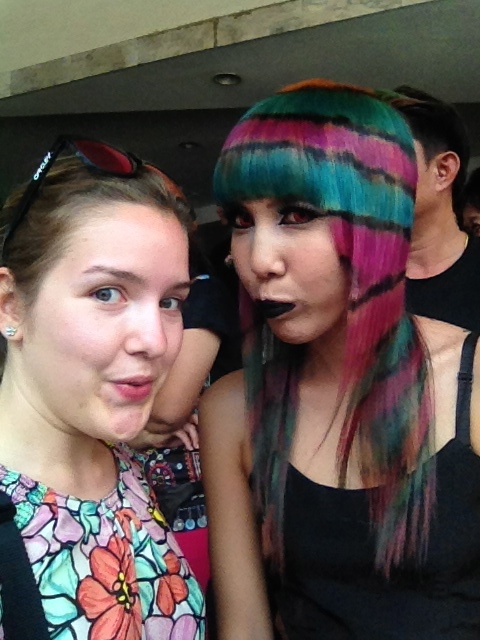 We’d stand there and someone who’d just had their ‘hair tattooed’ would come and take a picture with us. It was crazy. It was almost as if we were celebrities! They’d say things to us like ‘you so beautiful. so much’. They also loved taking selfies – I don’t know how many selfies I must have taken in 2 hours. It was one.after.another. The hair designs and makeup and outfit to match were really interesting. One girl’s hair had been dyed green, pink and black, and another girl’s hair had been dyed gold and was dressed as Cleopatra. 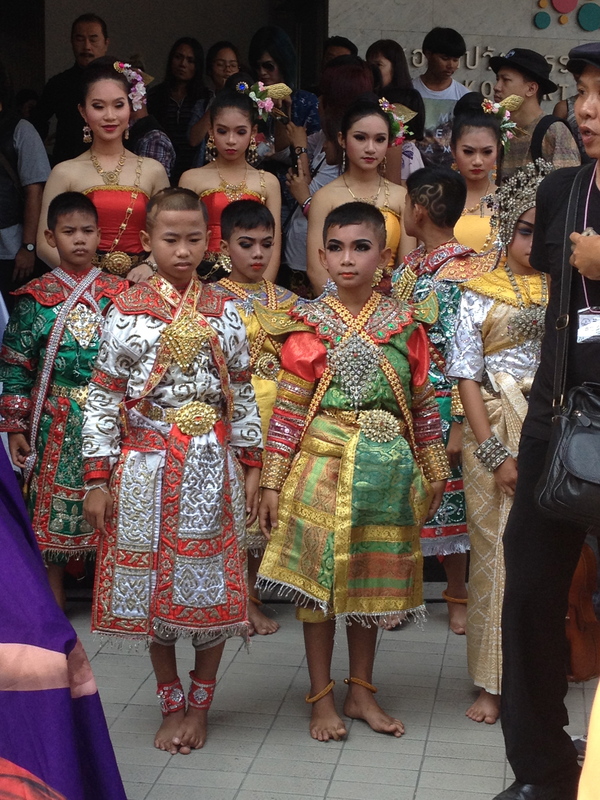 Even young boys had their hair shaved and were wearing make up – it was totally bizarre. Marc had been wanting a hair cut for a couple of days now and decided this would be the perfect opportunity to take advantage of a free hair cut. There was just a little problem of a slight language barrier. Unfortunately his initial attempts of communicating his hair tattoo desire were unsuccessful – obviously motioning scissors with your fingers and pointing to your head doesn’t work in all countries. 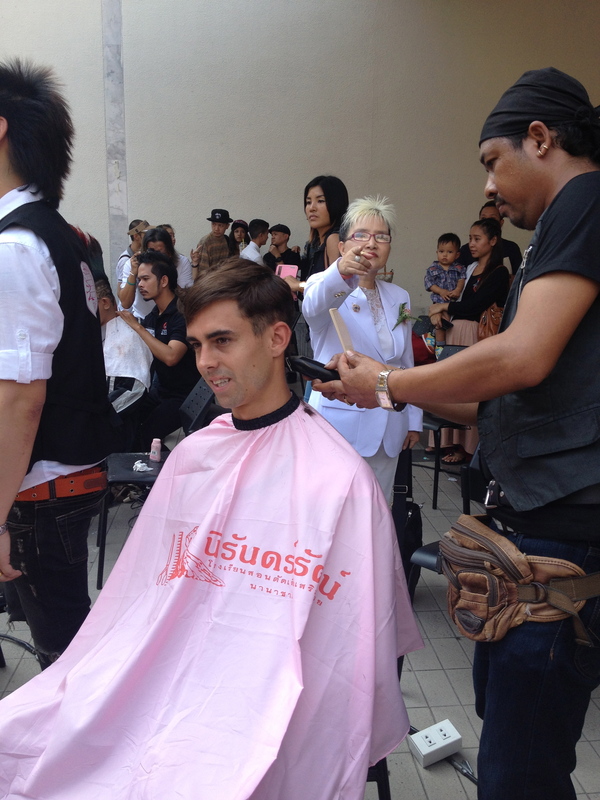 Luckily Kyle had a Thai phrasebook in his bag and Marc managed to string some Thai together and arranged a haircut. Thais couldn’t believe that Marc was going through with this. We had Thais coming up to us left, right and centre asking if he was actually getting his hair done. 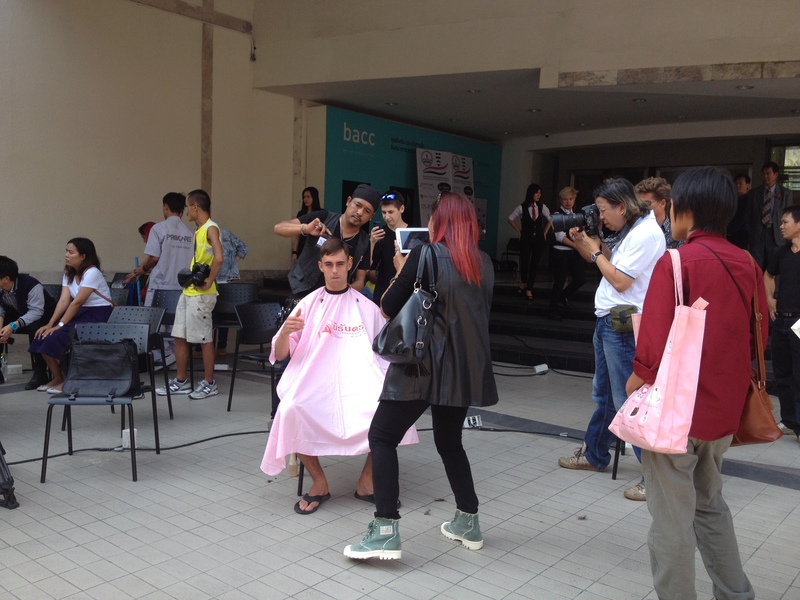 When he sat in the chair and the hairdresser started ‘tattooing’ his hair, we had photographers, film crews, instagrammers and a huge crowd of people watching ‘history’ taking place. They seriously couldn’t believe a Westerner was going to have his hair done! His hair looks pretty good too! Crazy couple of hours! 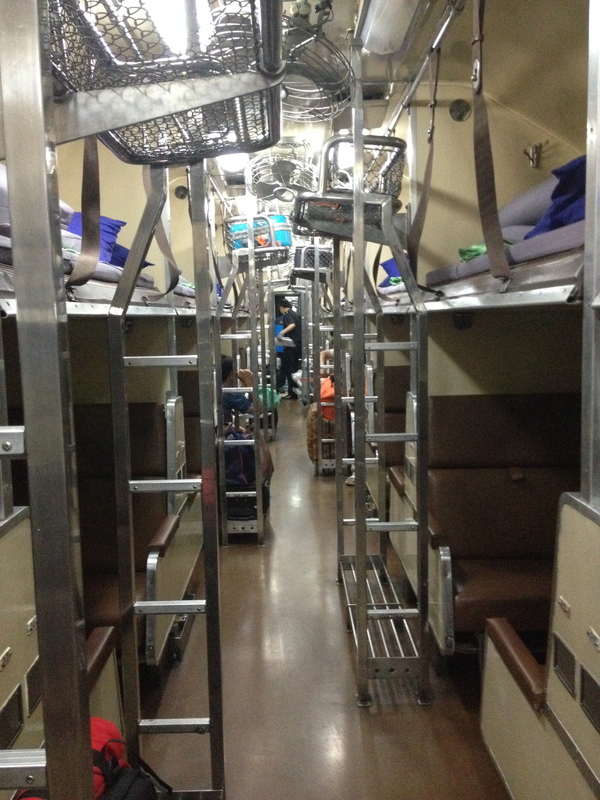 Time to get the sleeper train to Koh Tao. After pretty much doing nothing on day 1, we decided we’d step it up a gear on Monday and check out the temples. 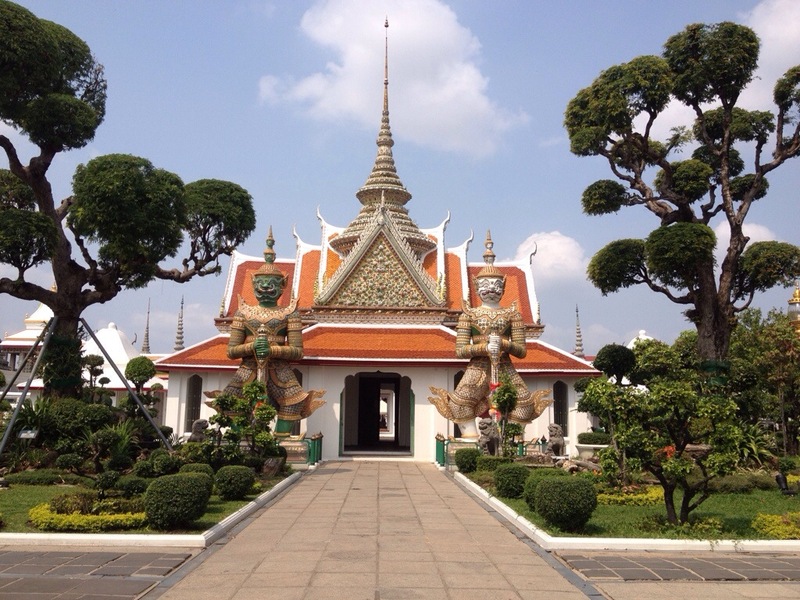 We originally planned to wake up at 7am to get to the Grand Palace when it opened at 8.30am, but unfortunately jet lag got the better of me…. I couldn’t get myself out of bed at 7. Kyle had been awake for several hours by this point (different time zones and all). Anyway I eventually pulled myself out of bed and we made our way to the Grand Palace. 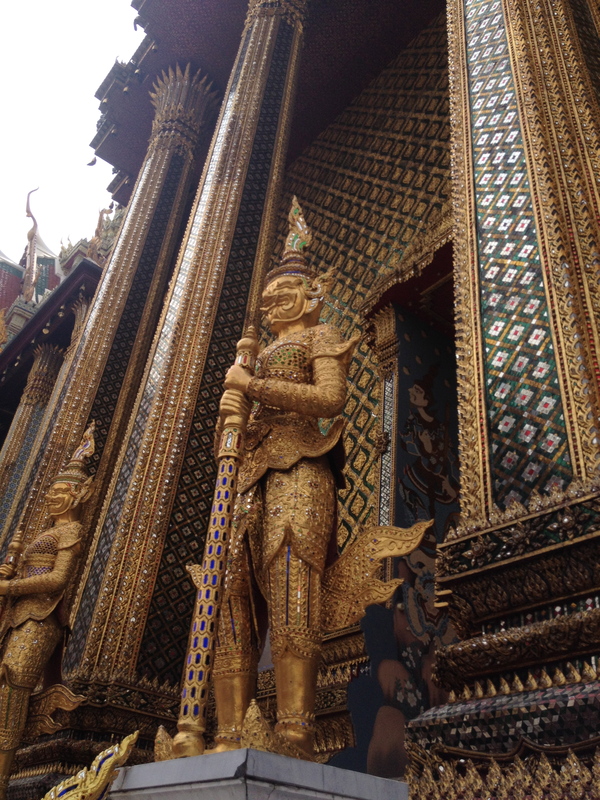 The Grand Palace, home to the Emerald Buddha, was pretty cool. 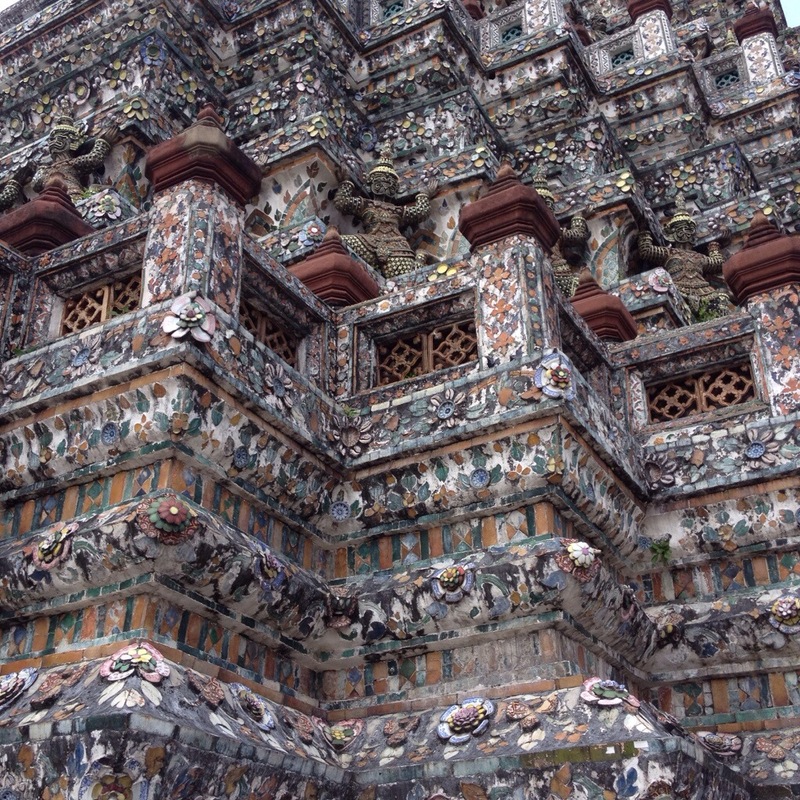 The buildings surrounding the temple were decorated with intricate garudas. The Garuda is the national emblem of Thailand and symbolises divine power and authority of the king. 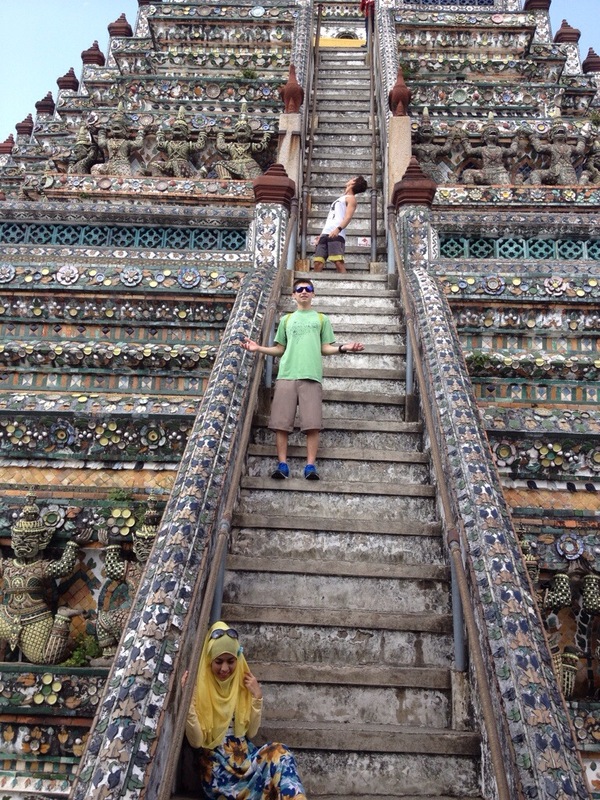 The actual temple of the Emerald Buddha was a little disappointing. When you see pictures of it online, it looks huge but it was actually tiny (oh and no pics allowed!). 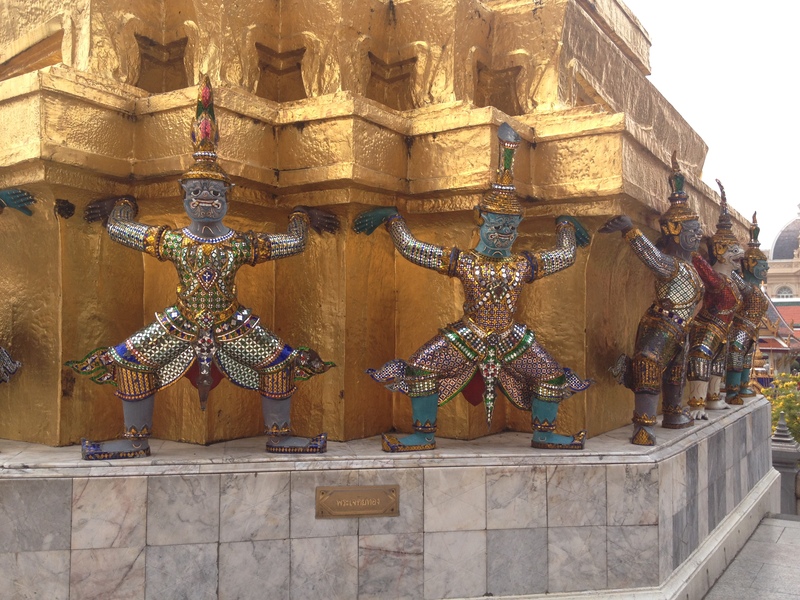 The Grand Palace buildings were more interesting than the temple itself. 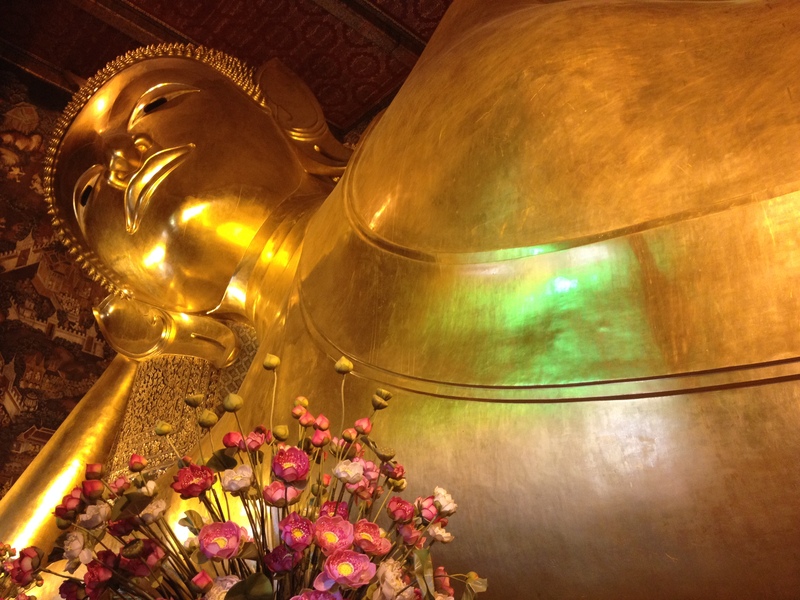 Around the corner from the Grand Palace is Wat Pho, home to the reclining Buddha. 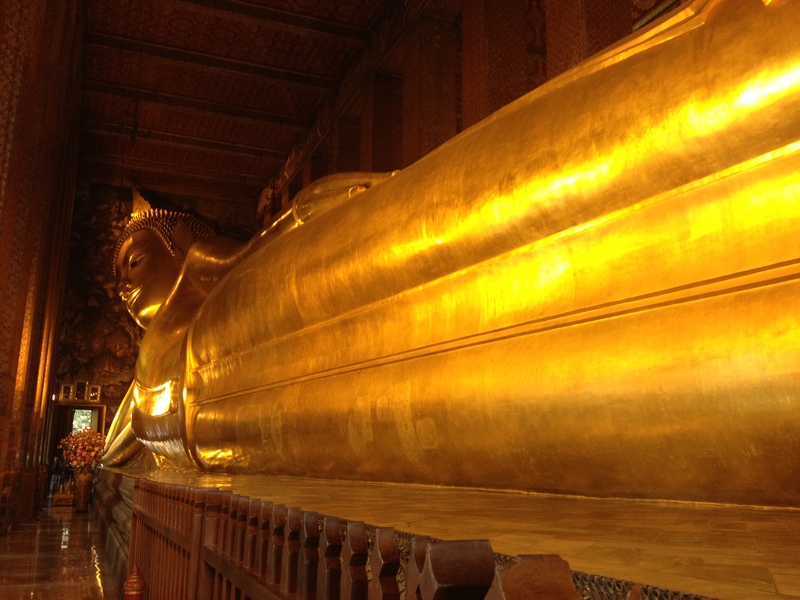 I really liked Wat Pho – the Buddha here is like 43m long and alongside it there were 108 bronze bowls with different characters of Buddha. Thais put money in each bowl as they believe it brings them good fortune. 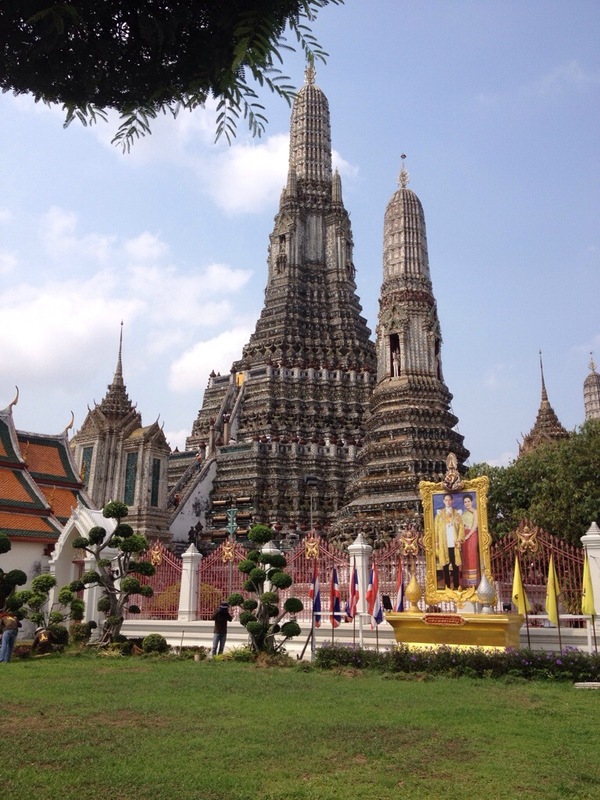 After Wat Pho we were getting a bit sick of temples but decided to see one last temple in Bangkok – Wat Arun. They were doing some construction on it, but boy was it an amazing wat. 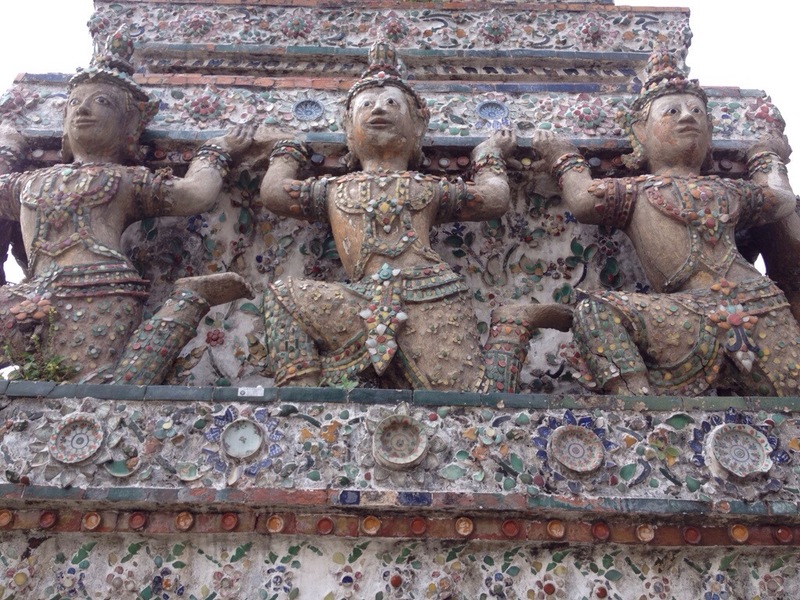 It was very different to the Grand Palace and Wat Pho as it was encrusted in porcelain and not bronze. Plus, we had to climb all the way to the top! It was pretty steep!! It’s pretty hot and humid in Bangkok at the moment, it’s about 35 degrees. This city is absolutely insane, there are no driving rules here!! You can really feel and taste the pollution in the air. Time for the beach soon me thinks.